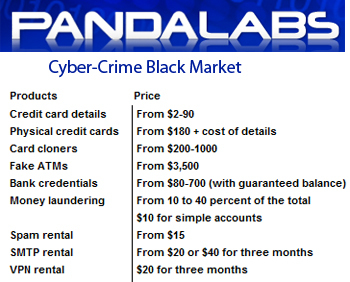 Details PandaLabs Cyber-criminal Black Market Report ! PandaLabs researchers published an investigative look at the growing online crime, cyber black market where it sold the stolen credit card information and other data stolen more than 50 shops, mostly online. PandaLabs clues about how the black market of cybercrime has diversified and now sells a much wider range of sensitive information such as bank account hacked logins, passwords, credit card fraud and more. Market access in general can be obtained in person contact with hackers who are promoting their sales information in the forums and chat rooms. PandaLabs, in particular to identify key competitors in the computer crime and the rule of supply and demand, prices are competitive, and traders will also offer rebates to buyers of high volume. They offer free access to "process" to debit or credit card stolen and money back guarantee and free trade. Additional information is available in the PandaLabs blog.